This entry was tagged birthday, party, Washington Market park. Bookmark the permalink. That is really a cute invitation! Sure wish I could come! Oh man Mark! You have done it again! That is the cutest thing ever! Really wish I could be there with you all, and I know it will be a wonderful joyous day! Love you all! (I can hear the germ comments already) te he. Love how he wears that backpack and is so damn cute! 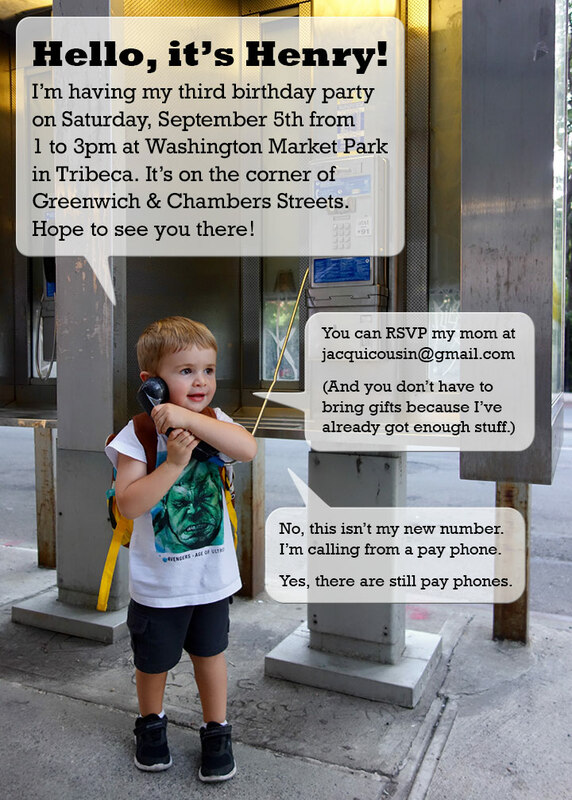 I love the invitation, Henry’s adorable and what he’s “saying” is so funny! Yes, pay phones are almost extinct. Wish I could be at the park for Henry’s 3rd birthday party. At least I got to see the park when I was in NY last October & it’s beautiful. Oh, I didn’t notice the backpack until I read Aunt Juj’s comment – so cute. And love the Hulk shirt! Mark, do you remember the metal Incredible Hulk trashcan that was in your & Chris’ bedroom? I kept that trashcan until just a few yrs ago.